Rohtang Pass 2017 clearing starting out early, Border Roads Organisation began snow cutting operations from Rahla fall (27Kms from here) on the Manali-Rohtang-Keylong road and set out a stiff target to open the snowbound pass in May. Aiming next target it to open the road to Leh in Ladhak. The entire road which normally is thrown open for public transport by end of May or early June . This year the snow clearance has begun from Rahla fall, 27 kms from here, higher up on the road to the pass and not from Gulaba (23 Km from) here) this year. The mountain passes have received very heavy snow this year and the higher altitude wears a thicker snow cover this season. 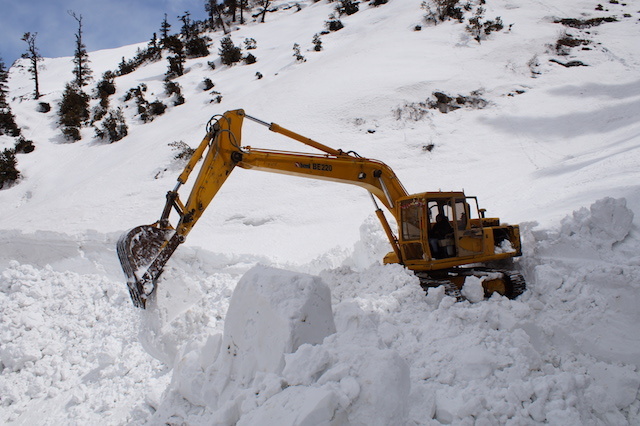 Last year BRO had started snow clearance operations for Rohtang Pass on March 19. The army road engineers claim that the road till Rohtang will be cleared over the next few weeks. The snow clearing job was officially started after prayers and a puja today. 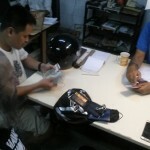 BRO performed the puja for seeking divine grace for ensuring a smooth operation and safety of their men and machinery. According to 38 Border Road Task Force (BRTF) Officer commanding LT.Colonel Mayank Mehta, the organisation is trying to open the highway for traffic movement as soon as possible. “One team will move from Rahla fall towards Rohtang, a second team is approaching the pass from Koksar side and third team is removing snow from Darcha towards Baralacha pass. 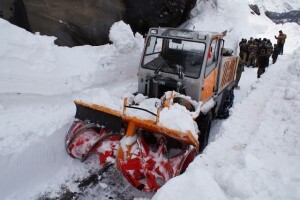 All the teams have dozers, snow cutters and enough manpower,” said Lt Col Mayank. The highest snow deposit that has been cut so far is about 15 feet high wall of snow at Rahla falls. 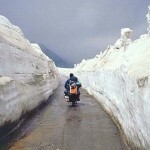 Next challenge will be to cut the through the Rahni Nullah thick snow deposit on north face of Rohtang. “We shall try to connect Keylong with Manali in May subject weather conditions. Then we shall concentrate on opening of Manali-Leh highway till Sarchu, 222 Km from Manali. Meanwhile, our machinery is engaged in formation cutting to widen the highway,” said Lt. Col Mehta. Despite heavy snowfall recorded from December to March, army jawans involved in road clearing operations are working under extreme cold conditions. The day temperature is minus 10 degree Celsius, and high velocity winds blow make the working environment very challenging. Personally I have plans to ride this road come June 2015 with my Thai friend on rented Royal Enfields ridden from Dehli.